Today I wanted to share a few of the tips and tricks I have on rotating my children's toys. You might have missed "How to Rotate Children's Toys and Books: Part 1", make sure to check it out. In our house we have a "bonus room", basically all that means it is a big room without a closet. So this is our T.V./toy/exercise room. It can get a little crazy. So we have one corner dedicated to the kids toys and books. It isn't a big corner so I had to figure out a system to keep the clutter down and still keep the kids entertained. That is how I started our rotating system. In Part 1, I showed you my cleaning chart. Part of my quarterly cleaning is to rotate books as well as toys. You can grab your own cleaning chart HERE on our site. Most of our toys have many parts. You know like a racetrack with different tracks and cars. Or Mr. Potato Head. So I store them in my I Spy Tote Bags. This is a simple pattern that comes in 3 sizes, but they are great for storing toys, games and puzzles. You can grab the I Spy Tote Bag Pattern in all 3 sizes in my Etsy Shop. It is a very reasonable price and I promise you will use them all the time! Once all the toys are bagged up, they are put in a box. Each quarter I go through the toy corner and the toy box. All I have to do is switch. Some toys stay out, others get put in the box. And since they are already bagged in I Spy Tote Bags, if the little ones want something we put away, I can simply pull the bag out of the closet. One of the other great ways I found to better organize is with my Wire Puzzle Storage Rack (affiliate). You can easily grab one on Amazon. It really has made a huge difference. Not only are the puzzle pieces not all over the floor, but we play with the puzzles a lot more. It may not seem like much, but it is amazing what a little organization can do. The kids can find toys easier and they seem happier. Not as much to distract or upset them. Just a few fun toys and room to play with them. 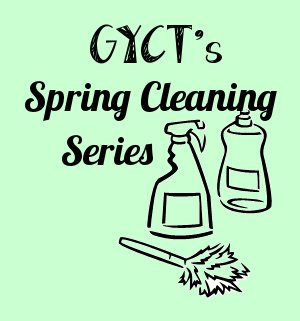 Make sure to check out some of our other Spring Cleaning tips and tricks.